Banaue is often shrouded in a thick layer of mist. 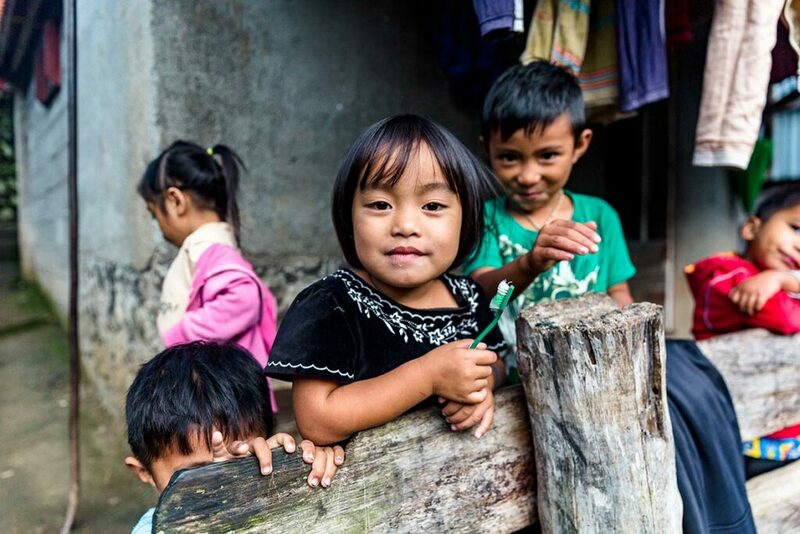 Perched high in the Cordillera mountain range, the town is surrounded by an epic landscape of sweeping hills, dotted occasionally with clusters of tin-roofed houses. 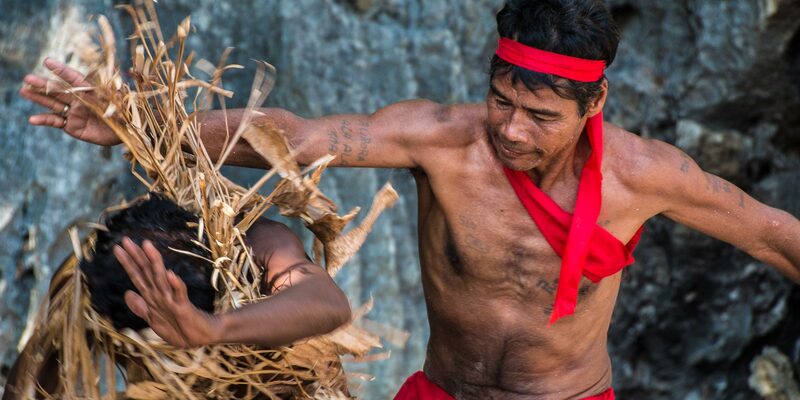 It’s not a scene you might expect to see in the Philippines – where turquoise beaches and picturesque palm trees dominate the country’s marketing material, but Banaue offers a cultural experience beyond anything these islands can offer. 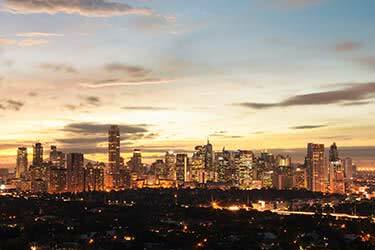 The town is located in Luzon’s north, on the largest island of the Philippines’ 7,000. 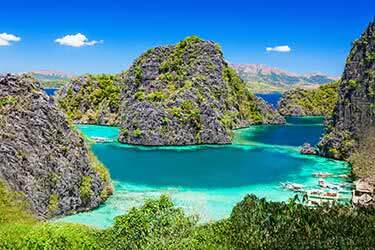 Away from the white sands of the smaller islands, the mountains of Luzon are home to some of the world’s most impressive rice terraces, a unique tribal culture, and some unforgettable trekking. 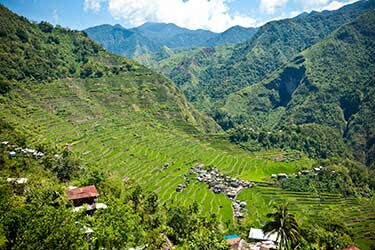 The Ifugao region which surrounds Banaue is known for its rice terraced hills, which are some of the most impressive in the world, covering 4,000 miles of landscape. There are 48 clusters of rice terraces in the region, and 5 of them have UNESCO World Heritage status. The terraces at Batad, which can be easily visited from Banane by trekking or jeep, are one of these five. 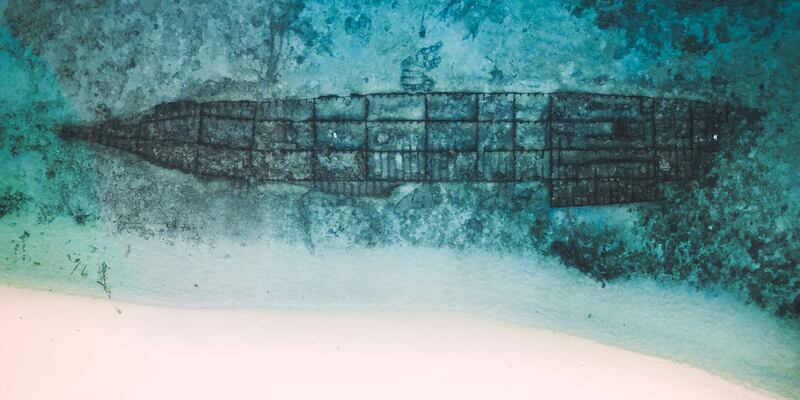 It is thought that the carving of these terraces began some 2,000 years ago, when the Ifugao people created steps into the hills and formed a system of irrigation where water from the high mountains gets filtered to the lower terraces, creating more rice cultivation. Taro, a local potato, was also originally grown on the terraces, but later rice became the dominant crop as it still is today. ABOVE: Vista from a Banaue viewpoint. 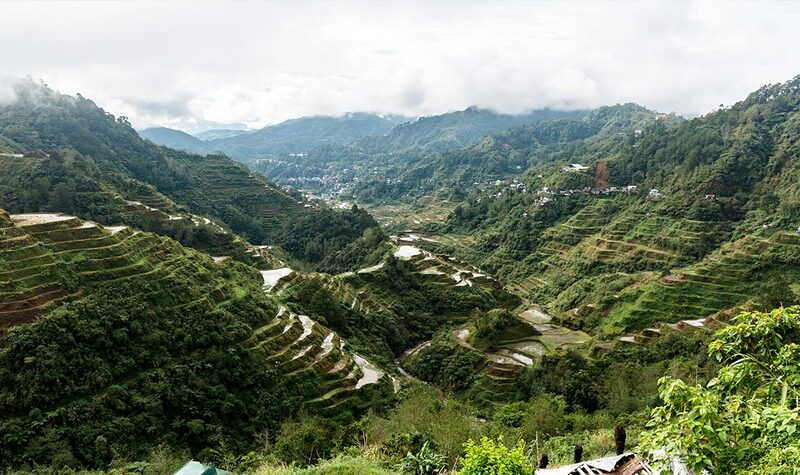 For a visitor, the best place in the town to admire the terraces is from the Banaue Viewpoint, a steep walk or quick rickshaw ride above the town. Alternatively, many of the restaurants in the town have epic views onto the rice fields, and you’re guaranteed not to get caught in the areas high rainfall. ABOVE: Images of the Ifugao of Banaue. While you might come to Banaue for the epic terraced landscapes, I guarantee it’s the people and village life which you will stay for. 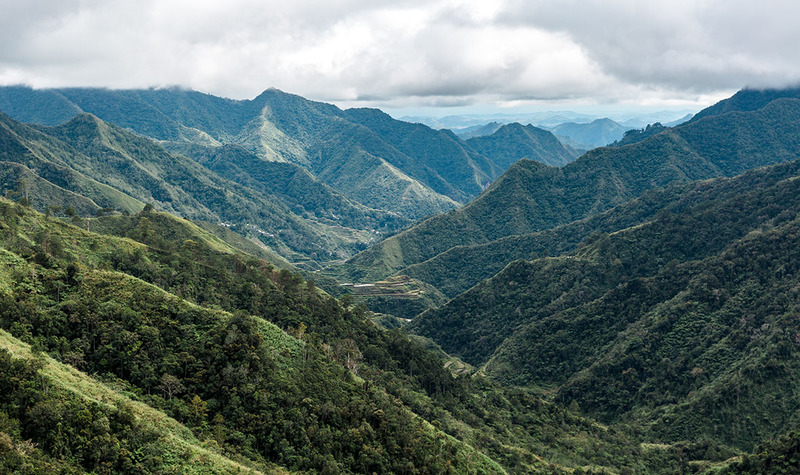 The sweeping Cordillera mountains which surround Banaue are home to a number of ethnic tribes, with the Ifugao being most dominant. 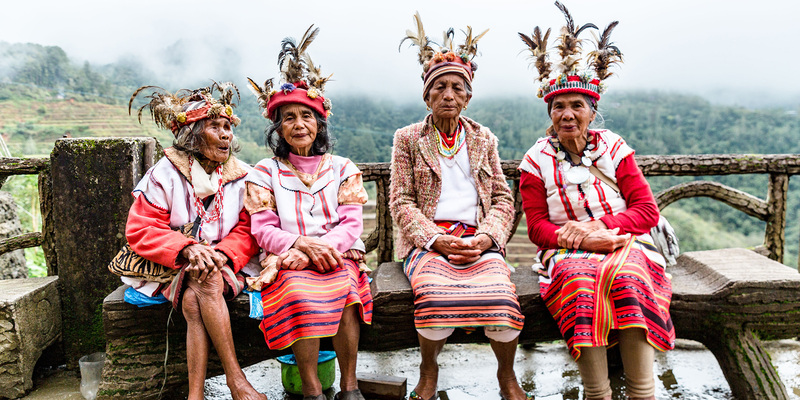 Ifugao translates to ‘people of the hill’, and trek from village to village and it’s easy to see why – these people have spent generations living on steep, seemingly inhospitable mountains. They are traditionally headhunters, although this tradition has long died out, and there are now only a few remaining elders who remember the days of this tradition. 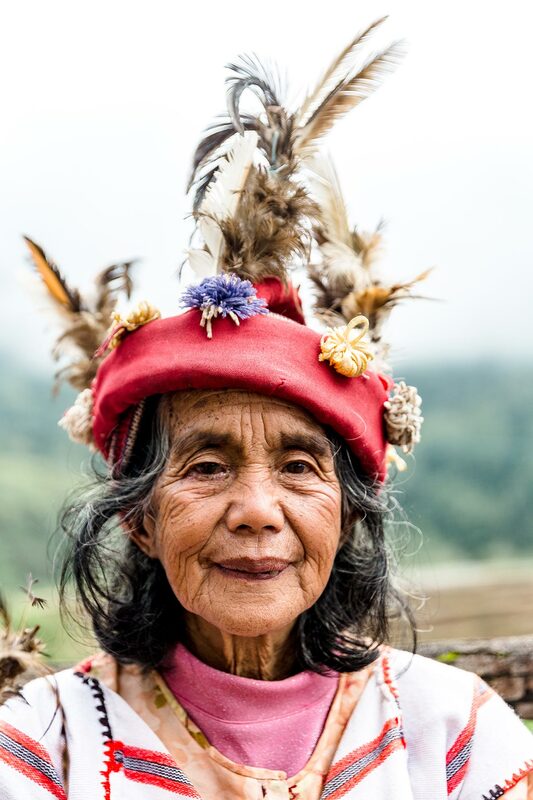 ABOVE: Ifugao woman in traditional dress. 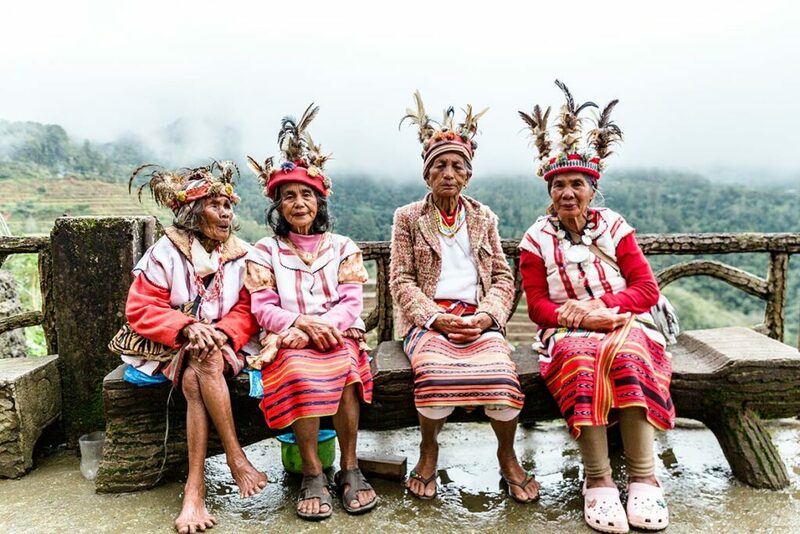 Nowadays, most youths in Banaue have swapped tribal fabrics for American branded jeans, but it’s still possible to get a glimpse of the traditional tribal dress and customs through the surviving elders who live in the hills around. 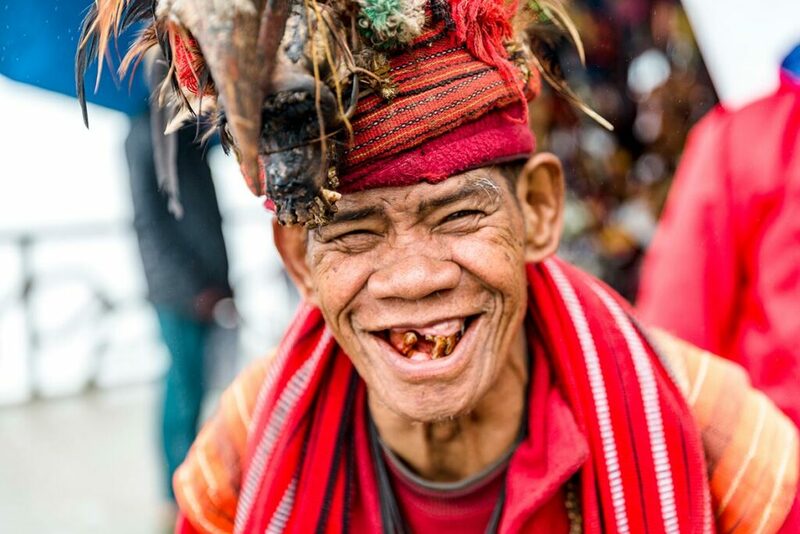 Trekking to Batad will give you a great sense of the Ifugao lifestyle, and a number of small handicraft shops and a cultural museum in Banaue town can give a great introduction to the crafts of the Ifuago. Woodcarving and textiles are some of the most unique forms of cultural expression still alive in tribal villages today. 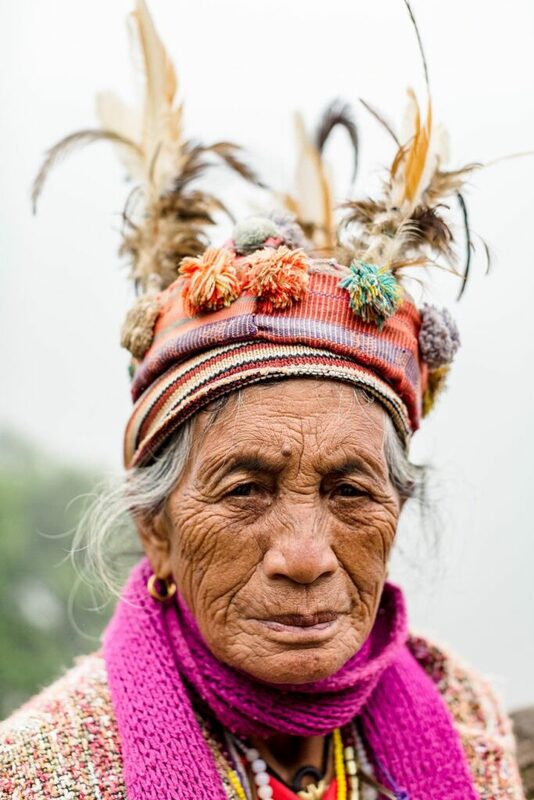 The elders around the town can often be seen wearing vibrant pink and red threads, and adornments of feathers and skulls on their heads. ABOVE: Trekking into the fog. 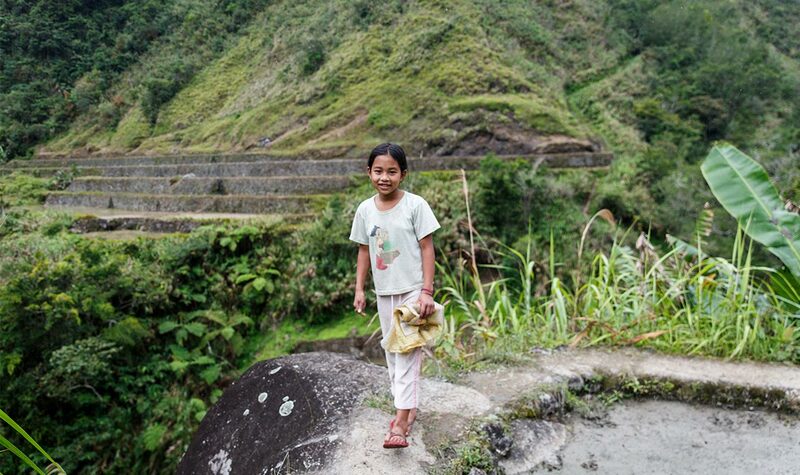 To get the best view of the regions UNESCO World Heritage rice terraces, head to Batad. 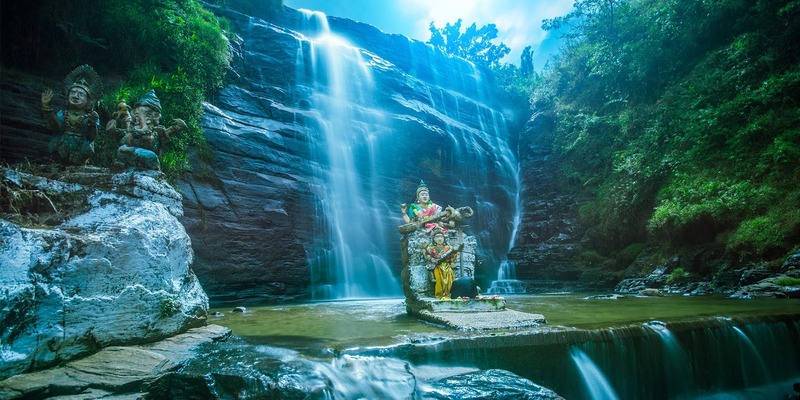 While the village can be reached by jeep, trekking there will show you a range of the region’s landscapes and allow you to enjoy the unique experience of village home-stays. 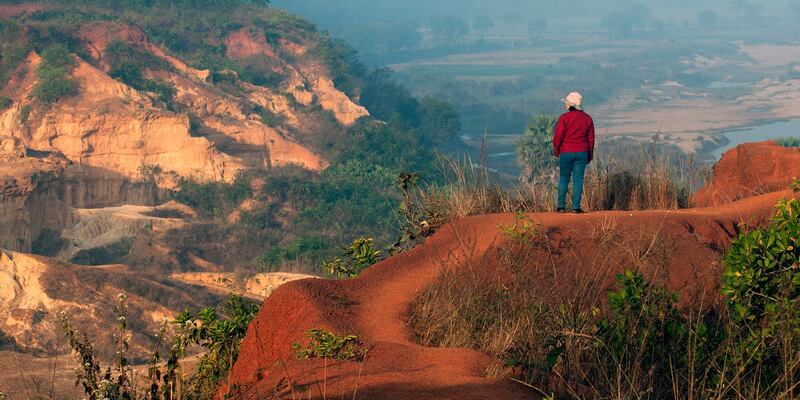 It takes 3 days to trek to the village which is home to around 1500 people. The majority of the trek is done by walking on the ancient rice paths which divide the terraces, and if you visit during harvest season, it’s a great way to witness the rice being collected up close. 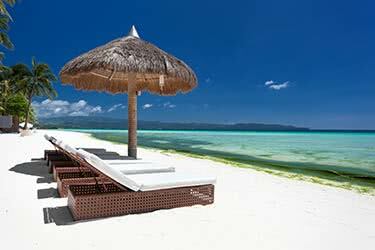 In the villages, you can spot traditional Bale houses, a triangular home on stilts which is used to house the Ifuago. While the local people have now opted for the more modern and weatherproof concrete and tin combination to build their homes, the Bales are still used as food stores and extra sleeping space for guests. 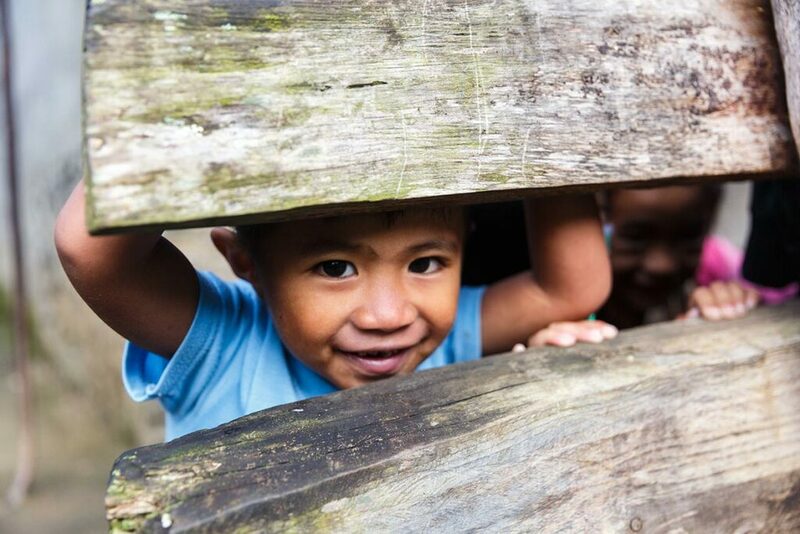 The three-day trek ends with the incredible view of Batad, the tiny village placed in the bowl-shaped valley, continuously terraced into slithering rice fields, and a feast of local rice in a village home-stay. 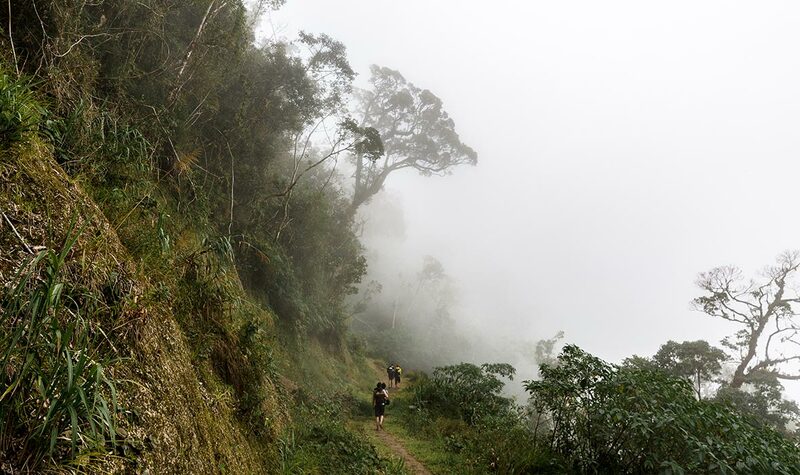 The weather is constantly changing in the Cordillera Mountains, so unless you want to end up trekking through constant rain, choose to visit in the dry season. The best time to view the rice terraces is April and May when the terraces are at their greenest. If you want to see the rice harvest, visit from June to July.